The populists’ new power game – in which Orbán is a more advanced player than Trump – is aimed at shaping the collective perception of the popular majority. It can go wrong. Hungarian Prime Minister Viktor Orban delivers a confident speech after being reelected as the president of the party Fidesz in Budapest, Hungary, on Nov. 12, 2017. Szilard Voros/Press Association. All rights reserved.Since the evening of February 25, Hungary has lived in a state of trance, collecting the scattered shards of the political room through the looking glass that, until that Sunday night, seemed to be the concrete solid reality of Orbania. 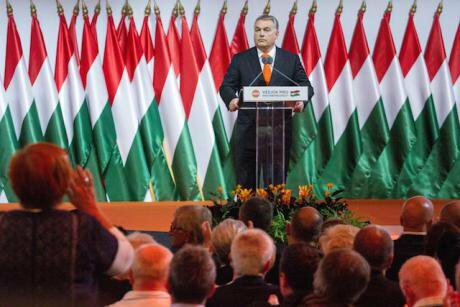 The shock came from a small-scale event, the defeat of the country’s ruling party, Fidesz, in an inconsequential interim mayorial race in a small rural town called Hódmezővásárhely. Still, all actors in Hungary see the event as a rule changer and a major defeat for Orbán (as correctly explained in the world press, see here or here). It is not probable that a similar miracle will follow in the elections in April, which are way too close for parties to adapt their strategy to the new circumstances. Still, Orbán’s shock loss may well represent the beginning of the end. What happened and why is it important? First, the race brought a totally unexpected landslide victory for an independent civilian candidate who had been backed by all opposition parties and won 58% of the votes against a mere 42% by the current vice mayor of the town. Secondly, the event brought new proof that there exists a possible winning platform for the opposition: coordination and one-to-one contests in every electoral district. Third, the symbolics: Hódmezővásárhely for Fidesz is home territory like Provence is for the Le Pens. Third, the symbolics: Hódmezővásárhely for Fidesz is home territory like Provence is for the Le Pens. It is the home town of Orbán’s right hand man and most powerful minister János Lázár who once served there as mayor. No left or liberal candidate has ever won in Lázár’s former stronghold. This is the prototypical Fidesz town that we instinctively associate with the immovably loyal rural background of Fidesz. Fourthly, add to this the timing: we are six weeks before the expectedly (bigger than ever) landslide national election victory of Fidesz. And the town in fabula – where it would have come as no surprise if Fidesz got 58% of the ballots – now votes in such an significant proportion for an independent social-christian rightwinger. The following table (index.hu) unravels the full extent to which a so far wholly invisible mass of voterly opposition expressed itself in the new settings of the 2018 elections, when an independent social-conservative civilian was the only contender of Fidesz. The above numbers provide clear support to an idea that many of us have instinctively sensed but could not prove: that Fidesz’s power stems less from being genuinely supported by the popular (near-)majority but from its ability to control the channels in which a popular majority can gain representation. The very essence of Fidesz power lies in confining the ways that the popular majority can be represented to the terms set by Fidesz. The strategy has been clear for many years. The Fidesz party state repressed almost all potentially risky referendum requests by force (mob force even, in one case.) For the same reason, Fidesz abolished the two round electoral system originally designed to aggregate a real absolute majority behind one of the two standing candidates in the second round. Fidesz’s strategy has been to narrow down maximally any institutional or symbolic channel of popular will formation that could have allowed for the uncontrolled rise of an uncontrolled popular majority. The very essence of Fidesz power lies in confining the ways that the popular majority can be represented to the terms set by Fidesz. Hódmezővásárhely was a shock event, above all, because it unexpectedly unraveled the very efficiency of this sort of power politics. In 2014, Fidesz could smoothly celebrate its popular majority in a system designed to incapacitate opposition parties and to push the dissatisfied majority into hopeless abstention. Dissatisfied voters expected that Fidesz was popular and that no opposition party could beat it, and stayed at home. By contrast, the 2018 race revealed that a break in Fidesz’s system releases huge energies and produces a radically different distribution of popularity. The case – and an almost identical one in Veszprém in 2015 when an independent “stole” a parliamentary seat from Fidesz and with it the 2/3 majority – brings in itself a key general lesson for countries where populist takeover is still a risk and not reality. The lesson is that populists’ popularity may well be a fake, manufactured popularity. This should strike all commentators who explain today’s populist revolt one-sidedly in terms of an alleged “popular soul” whose (just or unjust) frustrations find seamless expression in the populist voice. This type of commentary mostly focuses on potential causes behind the populist vote (A cry for help by hopeless victims of a reckless neoliberal globalization? A reactionary revolt of death-penalty-supporting authoritarians?) and uncritically assumes that the popular support expressed in that vote is genuine and not manipulated. By contrast, the case of Hódmezővásárhely exposes a different scenario: that the apparent distribution of popular support was a constructed artifact stemming from the manipulation of voters’ and parties’ common expectation that the popular majority is loyal to Fidesz. The case sheds light on a key and widely neglected structural analogy between today’s politics and the sphere of finance where the actual price of an asset (equivalent to the apparent popularity of political actors) is formed independently of its “fundamental” market value, for it is shaped above all by actors’ common expectations about that value. The financial analogy exposes a possible “valuation bubble”, which means that Fidesz has long been an “overpriced” asset: commonly expected to be more popular than it actually was. Its “fundamental” popular value was collectively overestimated until the shock event unveiled its very fragility. Seen from this viewpoint, the unexpected landslide of independent Péter Márki-Zay may be compared to a financial bubble “crash”. When the bubble popped on 25 February, actors on the right and the left cried out, in hope or in horror, that “if this can happen, anything is possible”. The possibility that actors’ popularity and voters’ preferences may be collectively misperceived, that a “valuation bubble” may exist, became a legitimate issue to think about – as usually occurs in the direct aftermath of a financial collapse. The possibility that actors’ popularity and voters’ preferences may be collectively misperceived, that a “valuation bubble” may exist, became a legitimate issue to think about – as usually occurs in the direct aftermath of a financial collapse. The analogy is not at all an arbitrary one: the structural transformation and crisis of finance prefigures to a great extent those in the mediatized political sphere (see my book for explanation). The financial analogy is absolutely essential to grasp the challenge of populist politics. The analogy allows us to reconceive the worst forms of populist politics in terms of financial fraud. Populists, like fraudsters in finance (eg. on derivative markets before 2008), make arbitrage profits from manipulating actors’ common expectations about the supposed opinion of the popular majority. In today’s politics, all actors speculate on what is popular in public opinion in the same way as investors speculate on how “the markets” judge the value of financial assets – and populists are in a privileged position to turn to their own advantage the common flow of speculation. Populists’ power stems from the fact that actors’ common perceptions of popularity, their expectations about “who is popular” and “what the people want” have become essential structural forces and key stakes of political competition in today’s mediatized democracy – just as important as, or maybe even more so than the “genuine” popular preferences themselves that actors speculate about. A structural shift takes place in today’s politics that makes it similar to finance. For some time, it had seemed that the key to political power in a popular media environment lay in attracting popular audiences. In this vision, politics is driven by the logic of a “popularity contest” which rewards the one who is the best in detecting and manipulating the genuine needs and wants and fears of the popular majority. Although it is common wisdom today to see politics as a vicious competition for popularity, the very target of the contest has shifted in the meantime, invisibly but solidly, from gratifying genuine popular preferences towards shaping common expectations on popular preferences. The new logic that makes politics akin to finance rewards those actors who are best at detecting and manipulating the “valuation basis” on which the popularity of political actors, slogans or policies is commonly judged by other actors. This logic opens a “speculation contest”, where actors try to establish their power by shaping each others’ expectations regarding who is popular and why. In these new settings, the question is no more “who is the more popular” but increasingly “who most seems to be more popular” so that the illusion turns into reality. In these new settings, the question is no more “who is the more popular” but increasingly “who most seems to be more popular” so that the illusion turns into reality. The above structural shift is due to the hollowness of the “popular representation” that is the core principle of today’s political system. In this system, elite-controlled parties struggle for pleasing the majoritarian public opinion that they hope to detect through polls. The popular majority is the key anchor point of the system (as opposed to social classes or other macro-groups once central to mid-twentieth century democracy). However, the popular majority or the “people” is by far too loose and evasive a category to possess needs or interests that could be represented. Parties are not able to “represent” it, given that genuine representation requires an ongoing vertical interaction between represented and representative, and in this sense only particular social groups (interested in maintaining such channels like mass parties or unions) can be properly represented. In recent decades, the hollowing out of group representation has made mass parties almost defunct in most countries. Today’s mainstream elite parties (“cartel parties”) cannot represent, and the “representativity” of the polls they rely on is also under permanent challenge. Polls are no longer commonly accepted as neutral thermometers of popular will or public opinion. No one really knows what the people want: the ‘people’ in the present political system is really “ introuvable”, no longer knowable, and this crisis of representation can only unleash speculative spirals regarding the will or opinion of the popular majority. The general uncertainty regarding the popular will triggers a stream of endless commentary that interprets it on every possible channel in the mediatized political system. Incessant commentary on popular opinion is “speculative” as commentators do not see their target clearly, while of course each holds a rock solid opinion about it. The popular majority is the key anchor point of the system (as opposed to social classes or other macro-groups once central to mid-twentieth century democracy). Commentators – pundits, bloggers, experts, journalists, politicians, voters – behave like speculating investors: they handle information complexity by accepting evidence their colleagues commonly accept, and by looking for fast diagnoses. The system rewards conformist “fast thinking”, the production of quick plausible hints, due to which most commentators tend to develop common understandings on “who is popular and why” and “what the people want or like”. This herding-like speculative activity may solidify into rigid collective beliefs on popular opinion that in itself can influence politicians’ behaviour and the processes of popular opinion formation, now becoming an autonomous structural force. The structural autonomy of “collective speculation on popularity” is a key vulnerability in today’s democracy that can be effectively exploited by fraudsters who know how to game actors’ collective beliefs and expectations in order to show themselves more popular than they actually are. These collective beliefs reproduce themselves autonomously, independently from the real distribution of popularity. The populists’ new power game – in which Orbán is a more advanced player than Trump, but the trajectory is clearly the same – is aimed at shaping the collective perception of the popular majority. Populists are masters of framing collective talk on popularity: they undermine existing conventions that define “popular majority” and deftly shift actors’ perceptions of popularity onto other and more controllable terrains. In – still existing – pluralist democracies, new populists cannot directly control the perception of popular opinion (as Fidesz once could in Hódmezővásárhely), but they can systematically undermine people’s trust in the two main conventional channels of “representing” it: parties and polls. The death of mainstream parties (postcommunists, left-liberals, the liberal establishment, the Washington party elites) is a baseline trope in populists’ rhetorics everywhere. Polls equally are key targets. “I just don’t believe the poll. I just think it is an outlier poll”, a self-defined “conservative populist” claimed very recently in relation to a survey that found majoritarian support for gun control in the USA. Rejecting conventional representations of the popular majority, populists organize alternative stages where the voice of the silent majority can express itself in a seemingly undisturbed way: rallies, townhall meetings, consultations with the nation, Twitter sh*storms. With these new alternative forms of popular “acclamation”, populists create a framed popular voice that is overwhelming and persuasive enough to fuel commentators’ speculative hype about their popularity. Controlling the perception of the popular majority by feeding the speculative hype machine with a framed popular voice is the core power strategy of today’s populists, from Orbán to Trump. Incessant speculative commentary on popularity heavily shapes political actors’ competition, voters’ perception of the stakes in any given political fight, and finally their votes. It pays off to frame the collective perception of the popular majority’s opinion, maybe even better than bothering too much with actual majoritarian opinion. This applies especially to politicians who have a well-organized core group which impersonates the popular majority credibly enough to be commonly accepted or taken seriously. Right-wing populists can profit more from this fraudulent game than other actors, as they have at their disposal a well-organized nationalist core constituency that they can use to impersonate their popular support and persuade observers that this support is majoritarian. By shaping the flows of incessant speculative commentary on popular will, populists like Orbán or Trump are able to make actors believe that they are genuinely popular and they turn this widespread speculative belief into a reality, by a self-fulfilling logic – reminiscent of the self-propelled logic of financial bubbles where common belief in the high market value of an asset does indeed make the asset more worthy, for a limited period of hype. Today’s self-defined liberal political systems are themselves “populist democracies” (the most essential theories are from Ankersmit, Touraine and Mair) where all actors increasingly engage in a fraudulent game of blowing populist valuation bubbles, of exploiting for their own benefit the self-fulfilling power of speculative expectations. We should make no mistake that the spectacular and very symbolic defeat of pollsters in the two shock events of 2016, the victory of Brexit and Trump, may already well be explained by the fact that pollsters themselves were caught up in the mainstream actors’ populist bubble-blowing activity, in which they lured each other and everybody else into the belief that the “normal” majority cannot go mad. Accordingly, 2016 may well be seen as the year of the bubble crash for mainstream populist democracy. If authoritarian populists can game the system, this is because the liberal mainstreams themselves have already based their power on a bubble-blowing process, in which they used biased polls and speculative media talk to shape voters’ expectations that the popular majority still stands with them. If authoritarian populists can game the system, this is because the liberal mainstreams themselves have already based their power on a bubble-blowing process. Seen from this view, the most reckless and aggressive populist actors do not do more than simply bring an existing fraudulent process to its logical end point, when polls are simply not needed any more to represent the will of the people, which now expresses itself in rallies and in social media talk and in national consultations and in actual votes. Authoritarian populist rule in Hungary represents the sad end point in a process where populist power has undermined all channels – from parties to polls and to media – that would allow for an uncontrolled constitution of a popular majority that might unseat the populists’ ruling position. In this case, “representative” polls succumb to openly manufactured public opinion. The popular vote can obviously not be regarded as genuine if it is born in a context where opponents consistently follow mistaken strategies, misperceive popularity trends and neglect the valuation bubble that entraps them. Hódmezővásárhely is a textbook case for such misperceptions. In one of the first interviews after his victory, Péter Márki-Zay shared his memory on how even his closest friends tried to talk him out of the crazy idea of running as an independent in Hódmezővásárhely, telling him that they themselves would self-evidently vote Fidesz. These self-reinforcing spirals of misperception and self-misperception and self-stereotyping may appear in polls themselves. A renowned political analyst has noted that in the days before 25 February, he was informed of two separate unpublished local polls that both predicted a higher than 60% win for the Fidesz candidate in Hódmezővásárhely. It is arguable that these polls were not simply wrong in the sense of wrongly representing voters’ preferences, for their numbers may equally be read as a correct mirror of respondents’ expectations about the majoritarian preference and their adjustment to the speculative opinion bubble. The more the populist logic of the popular valuation bubble takes over the political system, the more polls act as thermometers of the speculative opinion climate. This climate may arise spontaneously, but it is also increasingly imposed by dominant fraudsters who game the system and make arbitrage profit from the self-fulfilling force of their tricks. This climate may arise spontaneously, but it is also increasingly imposed by dominant fraudsters who game the system and make arbitrage profit from the self-fulfilling force of their tricks. The shock losses of Orbán in towns like Veszprém or Hódmezővásárhely (the very possibility that such events could occur even in a country where the public sphere is already strictly controlled by a semi-autocratic party state) should orient our attention toward the collectively blown “valuation bubbles” in politics which lure actors into overestimating the real “popular value” of populist politicians, while potentially paralysing and disorienting opposition and voters – a key element in the populists’ power game. Valuation bubbles mark the structural crisis of today’s post-representative politics that is corroded by the absence of embedded local representatives – local party bosses, union or civil leaders, local press – who could voice locals’ opinion accountably and independently from elite dictates, and cool down the steam of collective speculation by giving autonomous representation to local public opinion. The key to defense against populist fraud lies in erecting more stable mechanisms of local representation than the ones – elite-driven parties and polls – whose deficiencies are exploited by populist fraudsters. Only institutionalized, vertical channels that host ongoing interactive representation are able to save democracy from the valuation bubbles which overprice the popularity of actors who are commonly believed (hoped or feared) to be “popular”.